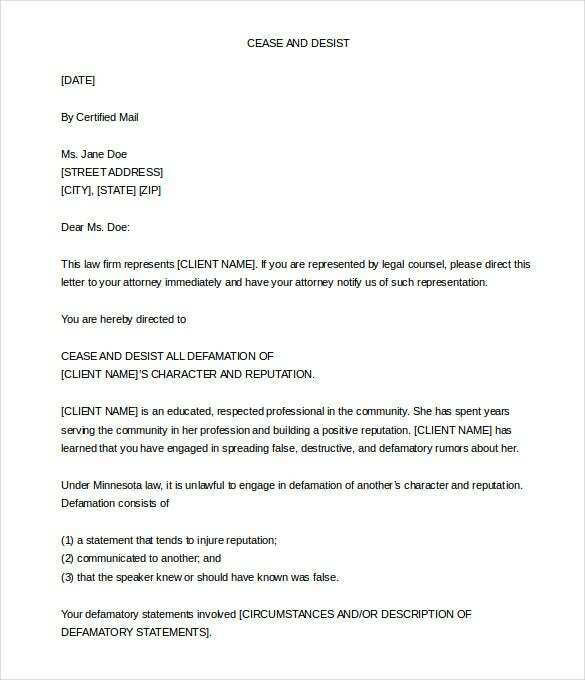 Cease and Desist Letter Template – 6+ Free Word, PDF Documents Download! Are you tired of those collection agencies that keep calling you about unpaid debts? 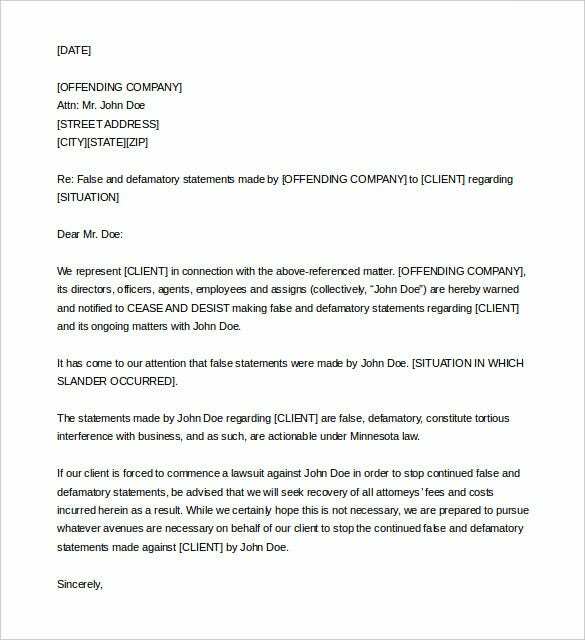 Use cease and desist letter template to send them a warning note. Otherwise, they will keep calling you, and those calls can really push your stress and depression levels. Once the recipient receives your legal letter template, they will immediately obey your orders and stop calling you too often. 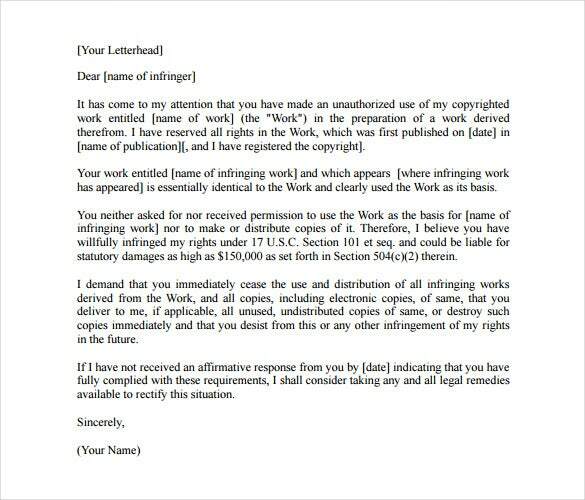 Cease and Desist letters are actually a legal binding on behalf of a user infringing the copyright rules and restrictions of any intellectual property which is named to a certain owner. 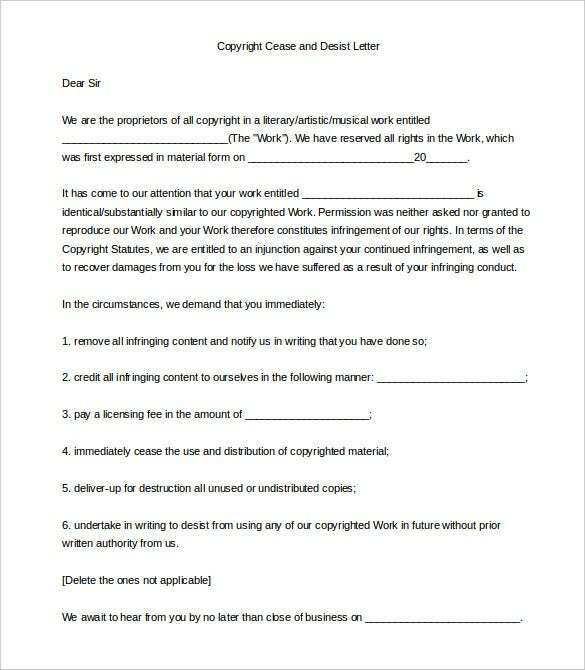 Such letters are generally in an assertive tone warning the defaulter to immediately stop using the copyrighted work to prevent any future contingency. 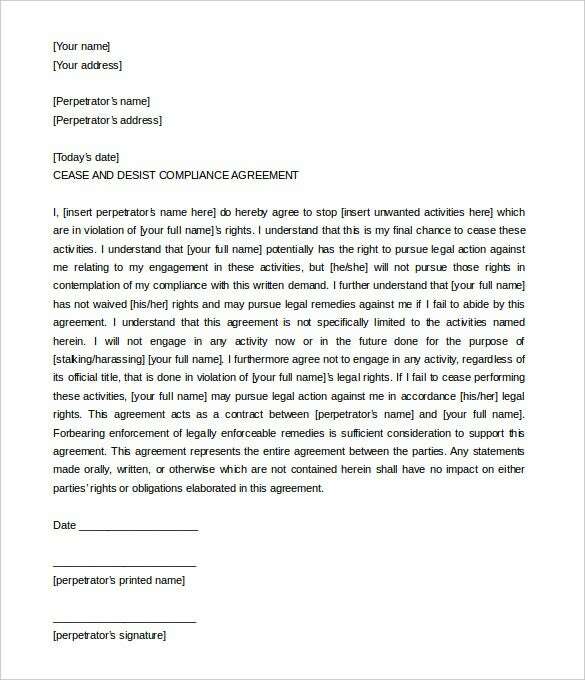 thompsonhall.com | Cease or desist letters for harassments takes the form of a warning or a notice letter to the defaulter to stop any incidents or practices which is causing inconvenience to the related party, or which is against the terms & conditions of the contract (in case of legal relationships). The letter should be authoritative mentioning the consequences of future default. 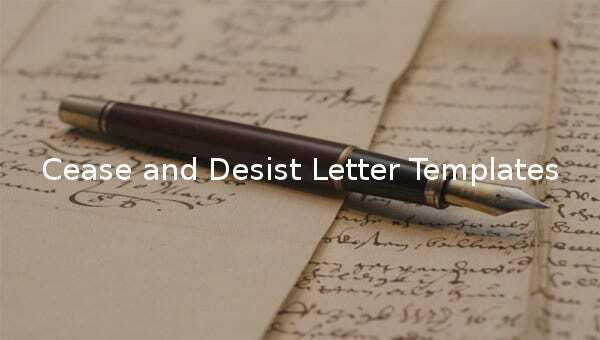 thompsonhall.com | Cease and desist compliance letters are a reply to the harassment warnings or notice stating that in future the defaulter would abide by the terms and conditions and make sure that their actions have no implications for other related parties. The tone in such letters is mostly apologetic in nature. 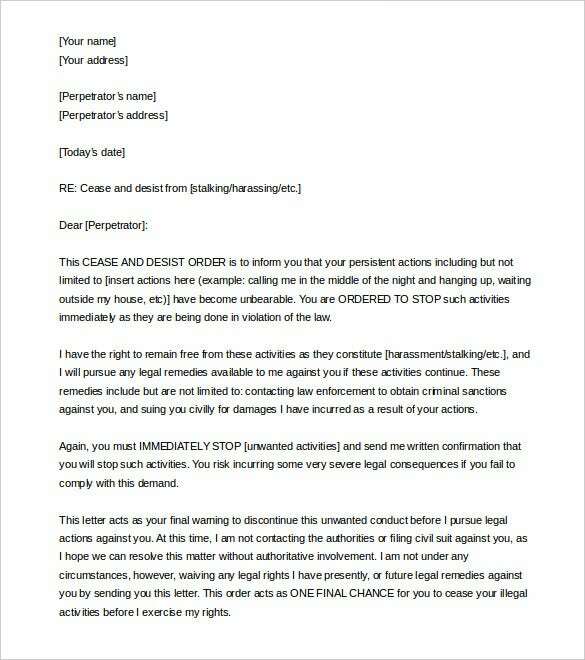 thompsonhall.com | Cease and desist letter of defamation comes into play when a person attempts to defame another character via any of its operations or speech. This action is unlawful and can lead to punitive actions. Therefore, defamation cease letters are directed to the attorney to cease all defamation charges which have been put to any individual. thompsonhall.com | Slander cease and desist letters are sent as a warning to the offending company in order to prevent any disputed or defamatory statements made on their behalf which is targeted to any of their clients. The letter warns the defaulter whilst mentioning the casualties which they may face in case they repeat their mistakes. The letter templates must include your name and address. The creditor’s name and address must be included as well. The body section of the letter must have a professional description. 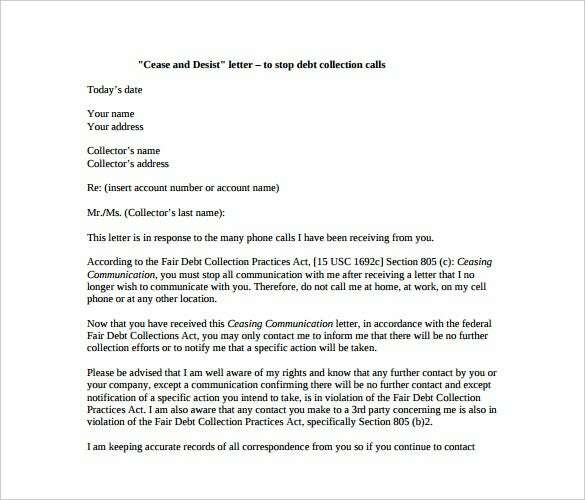 Include legal and genuine reasons why you do not want the collection agencies calling you all the time.